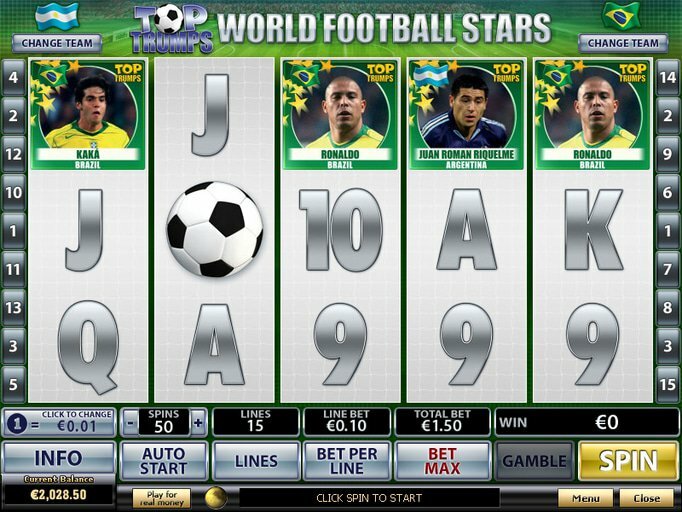 The Top Trumps Football Stars slot machine, available from Playtech, features five reels and 15 paylines in a silver-and-green football card theme. Now, this isn't the best of Playtech in terms of graphics or jackpots for that matter, but the potential jackpot win of $500,000 certainly makes up for the lack of aesthetic appeal. This can be accomplished by placing the maximum bet of $750, but those who spend more frugally can spend less - all the way down to a penny is allowable. This title is unique in that you'll need to choose both your home and away teams prior to your first spin. This means that you'll see three of the best players from each team on the reels as you go. You can see all kinds of real football legends on the screen as well as things like footballs, national flags and more. The Wild will substitute for all regular icons and help to provide wins, and it will even occur during the free spins feature although there is no multiplier. The Top Trump logo is the scatter and you'll get a payoff when two or more appear on an active payline as well as a multiplier based on the number of logos that prompted the win. If two identical flags appear on the first and last reels at the end of a spin, then you'll get 12 free spins. Finally, the bonus round occurs when a player and a football are found adjacent to one another. In it, the three players on your team will pass the ball around and your per-line stake will be tripled for each successful handoff. All in all, this is a simple machine with a bit of a twist that is geared toward individuals who really enjoy passing the pigskin. If you're interested in grabbing some Football Stars free spins just to try it out risk-free, then you can visit Bet365 Casino to do just that. If you decide you'd like to add some funds to your account, be sure you use the code BONUS100 before you do so that you can get a 100% match of up to $200.